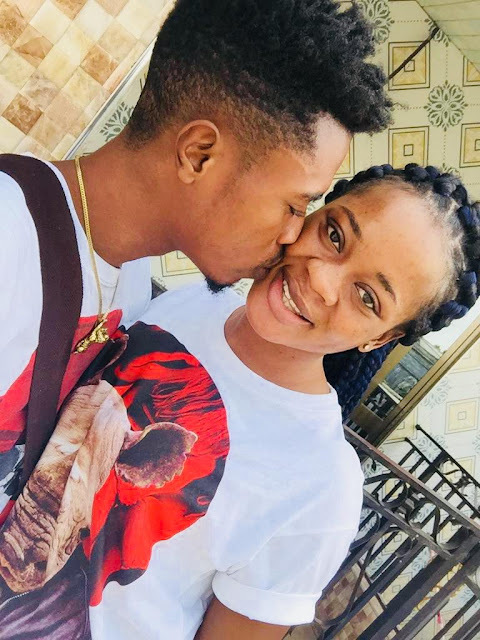 Hudson-Odoi Beamed: "I Am Very Happy For The Win. We All Worked Hard. The Manager Told Me To Go And Express Myself. I Feel Comfortable, Hopefully I Did Well." 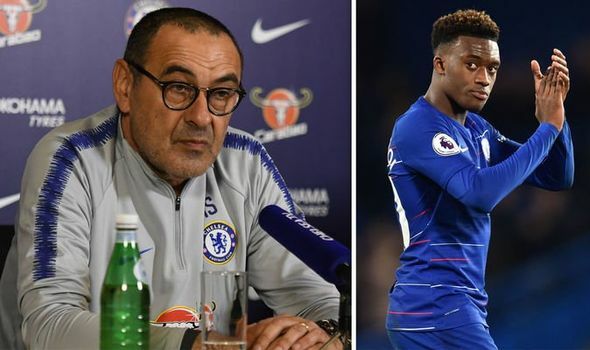 MAURIZIO SARRI reaped the rewards of finally putting faith in Chelsea’s kids but Callum Hudson-Odoi quickly found out he wasn’t happy with how everything went as the Blues ripped Brighton apart. AT LONG last, Maurizio Sarri turned to his Chelsea kids – and they ripped Brighton apart to boost his team’s chances of a top four place. Callum Hudson-Odoi produced a sparkling performance to help set to a crucial first goal, and his fellow England man Ruben Loftus Cheek provided a brilliant third strike to seal the points. The old guard also weighed in, Olivier Giroud converting Hudson-Odoi’s cross, and Eden Hazard pouncing on Loftus-Cheek’s pass for the second goal. The fans had been increasingly calling for Hudson-Odoi to be given his chance, and the 18-year-old did not disappoint. Neither did Loftus-Cheek, 23. Brighton were totally outgunned, and Chris Hughton’s team were left still looking over their shoulders nervously at that vacant third relegation spot - never mind an FA Cup semi-final against Manchester City looming on Saturday. That looks a mighty task. Loftus-Cheek added : "We have both worked all of our lives for this chance. Years of hard work - and now we start in a Premier League game together. That's good for the academy." A ruthless Sarri had made seven changes from the team that played so poorly at Cardiff on Sunday. 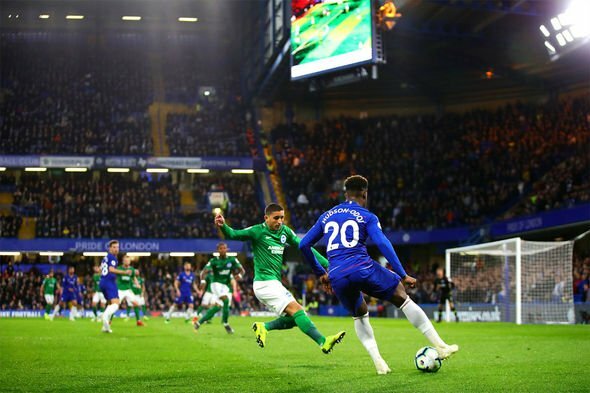 Hudson-Odoi made his long awaited first Premier League start – and his name got a huge cheer at the start. Sarri was told he was not wanted by unhappy fans in Wales. But the ovation for Hudson-Odoi masked any flack the manager might have got. The Chelsea manager said: “Callum is happy, but I told him that he missed a very easy goal in the first half. He has to stay with his feet on the floor. As Brighton packed their defence, it was the youngster who had Chelsea’s first chance as he saw his shot deflected over the bar. 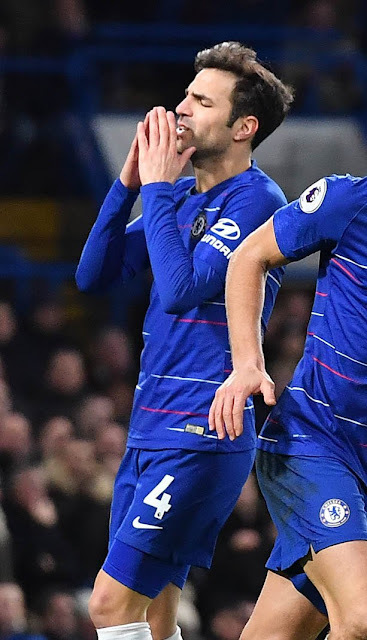 Solly March hit the side netting for Albion, who kept getting bodies in the way as Chelsea dominated – but another cross from Hudson-Odoi saw Cesar Azpilicueta miss, and then Hazard blazed wastefully over. But eight minutes before the break the youngster beat Anthony Knockaert, and his cross was thumped home by Giroud, for his first league goal since November. Nine strikes in the Europa League though had helped the Frenchman deservedly claim his place ahead of the dropped Gonzalo Higuain. The teenager then completely missed his kick six yards out, but he was always a danger – and he willingly tackled back. When Jorginho chipped the ball into the box, there was Hudson-Odoi sneaking in behind the defence, but his header lacked the power to beat Matt Ryan. It was Hazard though who grabbed the second, picking up a pass by Loftus-Cheek, jinking past Lewis Dunk and firing home. Three minutes later Loftus-Cheek made it 3-0 with a lovely goal, as Hazard neatly set up the England midfielder, who turned to strike a glorious drive into the far corner for his second goal in successive games. For Sarri the taunts were stilled. For now.